One person was killed on the northbound side of Highway 14 south of the Golden Valley Road off-ramp, April 12, 2019. | Photo: Austin Dave/The Signal. California Highway Patrol Newhall investigators have revealed new details surrounding the collision that killed a single pedestrian on the northbound side of Highway 14 Friday night. A report submitted by CHP officials at approximately 3 a.m. Saturday morning reveals the pedestrian in question — a man in his 60s — was walking along the side of the highway, south of Golden Valley Road, on the right shoulder. At 9:38 p.m., the pedestrian was identified by multiple callers as walking in the slow lane of the freeway, heading in a northwesterly direction toward the onramp. The driver of a 2002 Honda Accord then “attempted to take evasive action by steering towards the left,” but was reportedly unsuccessful in dodging the pedestrian. “CHP and L.A. County Fire Department personnel arrived on scene, but as a result of this collision, the pedestrian succumbed to his injuries,” the initial report read. 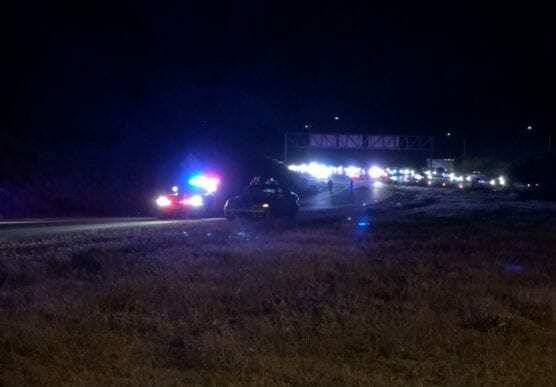 At approximately 10:30 p.m., all lanes were temporarily reopened on Highway 14, except the No. 4 lane and off-ramp would remain closed as a result of the investigation. By 1:12 a.m., all lanes had been reopened. Los Angeles County Fire Department officials confirmed they were called to the scene at 9:58 p.m., but no one else was transferred for injuries. The driver of the Honda was reportedly arrested, not on charges of hitting the pedestrian, but for having outstanding warrants for his arrest, according to Daryl Everts, a jailer at the Santa Clarita Valley Sheriff’s Station. The identification of the victim has not been released as of this story’s publication, pending the next-of-kin notification.